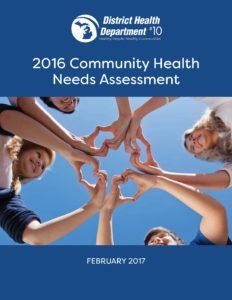 In an effort to better learn about and understand the health status of its communities, District Health Department #10 (DHD#10) completes a Community Health Needs Assessment (CHNA) process. CHNA is a collaborative process of collecting, reviewing, and analyzing health related data. The data obtained identify current, emerging, or future issues that may have a negative impact on the community. The results are used to educate and mobilize local communities, identify areas of focus, as well as identify available local resources for target issues. By looking at data specific to the communities we serve, DHD#10 and its partners can create a plan of action that best suits the needs of our communities. The CHNA can also be used as an evaluation tool to measure change from previous interventions and/or actions. Data gathered in the CHNA process will form the foundation for the development of a DHD#10 Community Health Improvement Plan and provides direction for DHD#10’s Strategic Plan.